Alsahwa Net- The US Ambassador to Yemen Mathew Tueller on Thursday said that ”Washington exerts efforts to end Yemen’s conflict”, pointing out that some Yemeni groups threaten neighboring countries with heavy weapons. 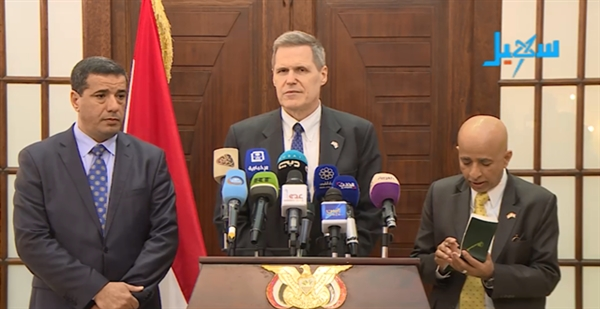 In a press conference held in Aden today, Thursday, Tueller said that Washington is concerned about Yemen’s situation, stressing that weapons must be controlled by the government. He called on to respect the ban on weapon export to Yemen, stressing that the US strategy in Yemen is to counter the extremist groups in Yemen. He further asserted that Washington is not supporting those Yemeni factions which seeks to divide Yemen, pointing out that the US Administration hopes to reopen its embassy in Sana’a.